From January 16th to 18th the EERA DeepWind’2019 took place in the lovely and snow-covered Trondheim. During this international event there was presented the best on-going research and innovation related to offshore wind farms, both bottom-fixed and floating. 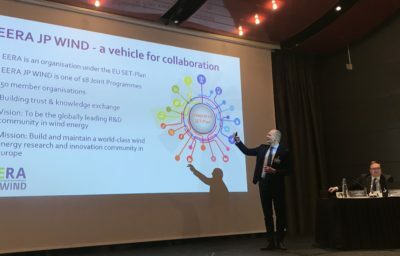 The conference was hosted by SINTEF and NTNU and organized in cooperation with the European Energy Research Alliance (EERA) joint program on wind energy. The programme included a mix of plenary presentations with broad appeal and presentations in parallel sessions and posters on specific science and technology themes. During the closing session by Aisan Cronin, chair ETIPwind, summarized the main points in the conference. Delivering the promise of offshore will be an enormous effort driven by the research innovation community and investors seeing the opportunity. The presentations and posters from the EERA DeepWind 2019 conference are now available at the conference website.